Please Note: The HD-D20W is no longer manufactured. Please refer to the HD Dome camera page for a replacement. The HD-D20W is a dome HD CCTV camera that uses HD-SDI technology for video surveillance applications. 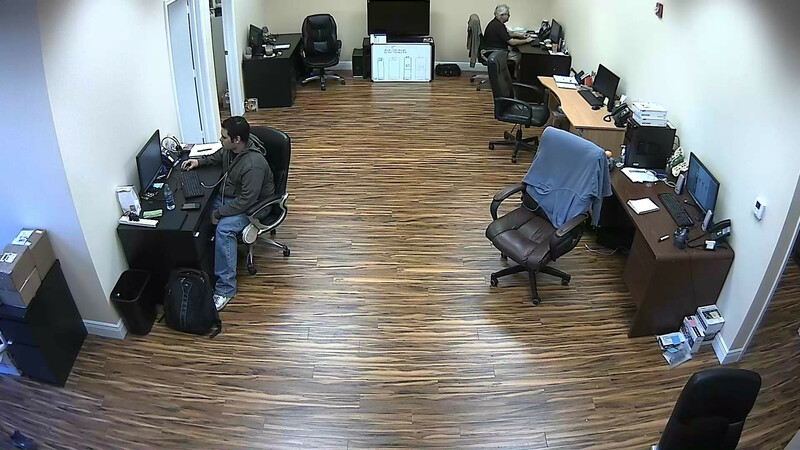 HD-SDI security cameras are capable of capturing video at 1080p resolution (1920 x 1080) using standard RG59 coaxial cable. The HD-D20W is enclosed in a plastic dome housing with a white base. This camera is designed for indoor video surveillance applications. The tri-axis mount of this camera enables installation as a ceiling or wall mount application. This high definition CCTV camera supports zero light infrared surveillance with the use of the built in infrared LEDs. When light levels are low, the HD-D20W automatically switches to night time surveillance mode by changing to black and white, engaging the IR cut filter, and turning on the infrared LEDs. The HD-D20W uses a 1/3 inch Sony CMOS image sensor and progressive scan system. This enables the camera to capture high definition CCTV video at 1080p or 720p resolutions. This camera has a fixed 4.3mm lens which gives a wide angle of view that requires no focus adjustment by the installer. Take a look at these sample surveillance images and sample videos that were captured using this camera. The on screen display (OSD) built into the D40W is accessed via a small joystick that can be accessed behind the clear dome housing. Using the OSD, security installers can adjust settings such as the WDR (wide dynamic range), digital noise reduction, sens-up, smart IR, and day / night settings of the camera. HD-SDI CCTV cameras can use RG59 Siamese coax cable just like traditional CCTV cameras, but must be used in conjunction with an HD-SDI DVR to record video. This camera is an excellent choice for indoor CCTV applications where high definition video is desired and light levels get very low or zero light recording is required. Important Note: this camera requires an HD-SDI compatible DVR if you want to record. The following sample images were taken using the HD-D20 in a room of our office that measures 16 feet wide by 30 feet long. Click to view 1080p resolution image. This is the optional wall mount bracket that is available for the HD-D20W. Important Note: it is recommended that you watch this video at full 1080p resolution by clicking on the settings button in the YouTube player (the one that looks like a gear) and selecting 1080p HD. Then click on the full screen button to watch in full screen mode. Watch the below video to see a comparison of HD CCTV camera video resolution versus traditional CCTV camera resolution. The HD video was captured using an HD-D20 dome, which is the black base version of the HD-D20W. Not convinced of the video quality that and HD security camera can provide and want to learn compare the resolution HD-SDI cameras to conventional CCTV cameras? Check out this article written by our co-founder. This camera uses built in smart IR technology which allows the camera to automatically adjust the intensity of the infrared illumination provided by the built in IR LEDs based on the distance objects are located from the camera. Click to learn more about smart IR.